Of course, the creatures called bigfoot weren’t invented in 1958. Hairy wildmen have been reported in North America for as long as there have been people there. The wildmen just weren’t called “bigfoot” yet. 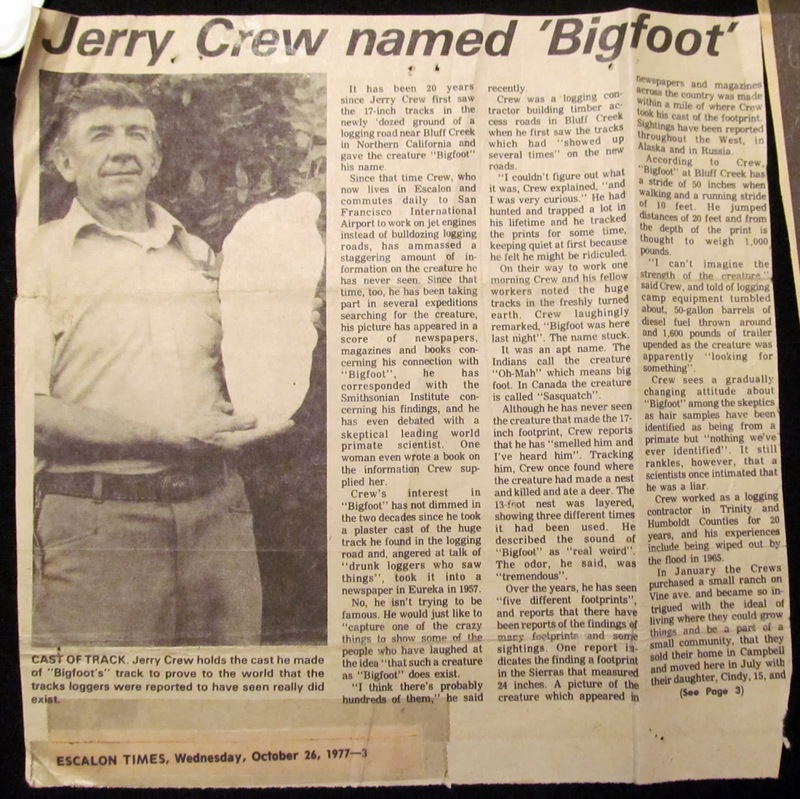 The word, “bigfoot,” was first used to publicly refer to sasquatches in 1958 when Jerry made those casts and brought one to the paper. I had always thought that “bigfoot” was the term used solely because the footprints that Jerry Crew and his men found were big. That seemed simple enough, and there was never any good reason to question that assumption… Until now. There might have been another influence on Jerry’s choice of names. Recently, I received an email from a woman named MaryAnn with a link to an episode from the 1950’s western, Death Valley Days. The episode’s title was “Mr. Bigfoot.” The episode is copyrighted 1956, two full years before Jerry named the creature that was making those big footprints. The episode is as corny as one would expect television to be in the mid 1950’s, and it made me smirk a number of times. At around the 25 minute mark in the episode, Professor Muchmore starts talking about “Mr. Bigfoot.” Muchmore explains that huge footprints measuring 18 inches long were occasionally found in the Owens Valley just west of Death Valley back in the 1860’s. The footprints were six inches across the toes, and the stride was seven feet long when the creature was walking. Sound familiar? The details and possible implications of this episode are interesting to ponder. I wonder if the episode’s writer had some knowledge of large footprints. Did some other person, perhaps a resident of the Owens Valley, observe footprints of this size and tell the episode’s producers or writers about it? The Owens Valley would be a likely place for a sasquatch to live. There are bigfoot reports to this day in the Owens Valley. At one time it would have been even better bigfoot habitat, especially back in the 1860s when the footprints were supposedly found in this fictional story, when the valley was more lush. Memaloose Island is a small , rocky isle in the Columbia River a few miles east of Hood River which the local Native people used as a burial site for hundreds, if not thousands of years. 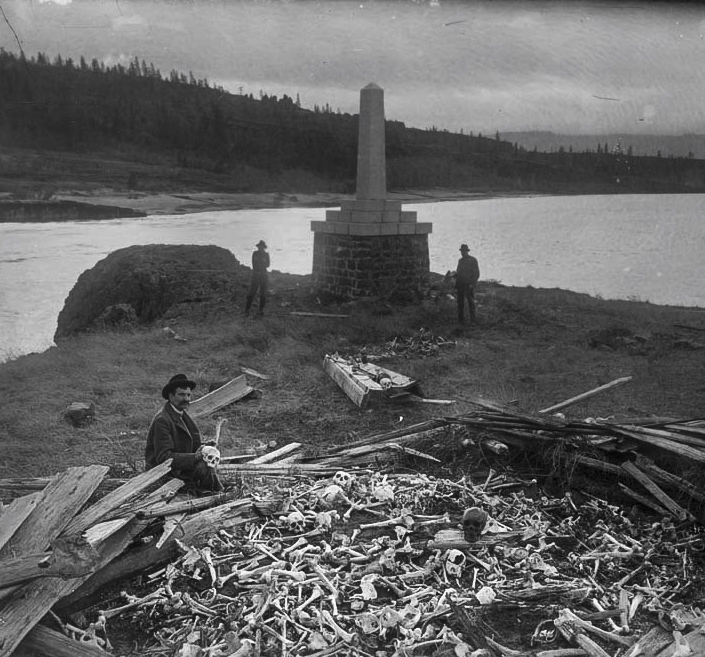 Until recent times, the Native Americans of the Columbia River did not bury their dead. They instead wrapped the corpses in reeds, skins, or other materials and placed them inside canoes or structures at sacred sites, such as this island. For an interesting history of the island, click this link (there are some pretty unsettling photos, so link-clicker beware!). I recently received an email from a friend notifying me of an interesting tidbit found in a comment under a photograph of Memaloose Island on the website www.HistoricHoodRiver.com. The comment is a short account from the recollections of Ira Rowland (1873-1965). He remembers being on the island a number of times, and vividly recounts his witnessing of Victor Trivett in 1883, when Ira was almost 10 years old. Click here to visit the page and read the full comment. Missing, of course, is the skull, any piece of it, or any photos of it. Also missing is the information telling us what measureing “jawbone to jawbone” means. It seems that Ira found the skull to be noteworthy in size, so it must have stuck out from the hundreds of other skulls on the island. The mandible seemed to draw the attention of at least two people, Ira and his uncle, Green. Without any supporting evidence, there is only a little we can uncover about the possible size of the jaw. But, with unclear language as our only clue, there are a few ways to think about this mystery. First, and possibly the most likely, it could be that Ira is not being factual, which is not to say that he was lying (though this possibility exists, too). Perhaps he was just told that his uncle measured it, or the number was exaggerated. We don’t know if Ira saw his uncle take the measurement, after all. We just have to trust that his memory served him well when his account was written down so many years after the event. Assuming Ira’s story is accurate, we might look at the other possibilities. Certainly, if the measurement is 13 inches from one mandibular condyle to the other (these are the two points on the jaw bone that are furthest up and back on the jaw where the linear distance between the two would be the greatest), this would be a massive skull. The average human male has a width of a little under five inches for this measurement. The giant skull would be 260% larger in this regard. This jibes well with what few estimates we have for the width of a large sasquatch’s head. However, Sasquatch skulls would certainly be morphologically different than a human’s in ways other than size, especially at adulthood and of this size. One would wonder why no other unusual features were mentioned in regards to the shape of the skull or the possible differences in dentation. A diagram showing the average human measurements. Another possibility is that Green Rowland took that 13 inch measurement another way. Perhaps it was the distance from one mandibular condyle around the front of the jaw to the other. To estimate the spread of the mandibles for comparison purposes, I approximated the jaw into a half circle with the half-circumference of 13 inches. Using C=2πr with C=26, the radius is 4.14 inches. Doubling this for the width of the mandible gives us a spread of 8.28 inches, still very large indeed. In fact, this measurement conforms nicely to just a little over the width of the largest gigantopithecus mandible I have in my collection (a bit worse-for-wear, but the first replica I obtained from Dr. Grover Krantz way back in the 1990s). Of the two measurements considered above, I think a linear measurement would be the most likely metric taken. The vertical aspect complicates the half-circumference method, and would probably be inaccurate once obtained anyway. If we consider Ira Rowland’s recollection of this giant mandible to be true and accurate, what kind of mammal did the mandible come from? Since Ira mentioned that a skull that went with the mandible, it can be assumed that it was a human, or at least very human-like. If the skull and mandible came from a human (Homo sapiens), then that was one big dude. There is no reason to doubt the possibility that a really, really big Native man lived at some point and had his remains interred on the island. This is the most logical conclusion, though the measurements cast some suspicion on this scenario. Some readers might opt for an explanation involving the numerous giant skeletons that are rumored to have been found in North America, but which the Smithsonian and other institutions have swept out of our view for some nefarious reason (I find most conspiracy theories tiresome and convenient excuses for a lack of verifiable evidence). This latter scenario seems the least likely of those put forth here so far. Another interesting possibility is that these bones might have come from a sasquatch that had been killed. This is also not a likely possibility, but one that is fun to consider. Could it be that at some point a bigfoot was shot in the head and killed, only to have its body given the funeral rites of any other Native American person at the time? After all, a common traditional Native view of sasquatches is that they are just another tribe of people living alongside their human cousins. It seems possible that a dead sasquatch would be treated with the reverence and respect offered to any other person and left on Memaloose Island with the other dead. The rest of the hypothetical bigfoot’s remains would be lost in the jumble of bones that was present on the island back in the 19th Century. They simply wouldn’t stand out like a skull would. While the discussion above is a fun mental exercise, it is of little importance. Without the mandible in question to examine, let alone a sasquatch mandible to compare it to, any conclusions are speculations at best, and utterly meaningless at worst (though I don’t really see this as a bad thing). All we can say with any certainty is that even if the report is true and accurate, and if that mandible came from a sasquatch, then another opportunity to bring in a substantial part of a sasquatch slipped though history’s fingers. Still, I have to wonder… If this tale is true, where is the skull? For another story about a possible sasquatch skull and another missed opportunity, click here.